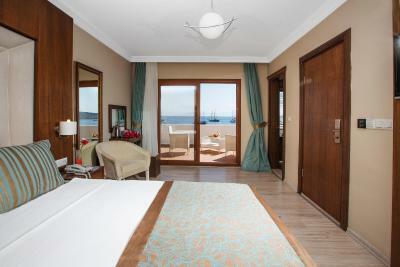 We had the Executive Suite with Sea View and terrace. It has a wonderful view of the ocean and harbor and castle. The hotel is just steps to the sand and the bazaar. The staff was mostly friendly and helpful (except with the wifi). The view from room 202 was nice. Staff works hard and were very nice. Great location right on the coast. And just a ten minute walk from where you get dropped off from the airport shuttle bus. Additionally, the breakfast was copious and filling to get you going for the rest of the day. Staff also let me leave my luggage for most of the day, which was appreciated as I had a late flight to catch. Location was good,staf very warm and hospitabilty.helpfull. The location is fantastic. 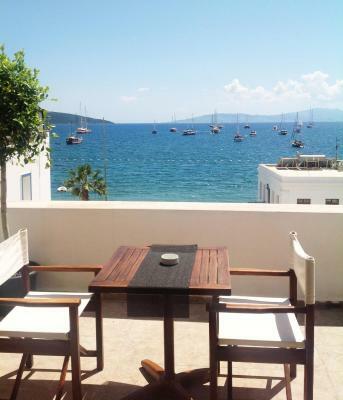 Very central and within the hub of activity in Bodrum and literally a stone throw away from the beach. Includes a lovely porch where we enjoyed having our breakfasts and chilling in the night overlooking the beach. Beach front Near to the marine and the local shop s A lot of restaurant and caves around Nice people and so helpful. The hotel is located very conveniently and it's easy to find. I walked from the bus station and it took me maximum 10 min. The staff was very friendly. 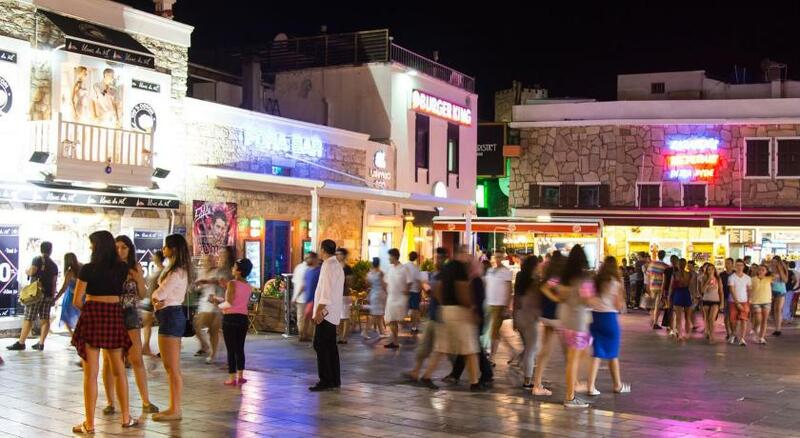 Just a few steps to the seafront, Akkan Luxury Hotel is centrally in Bodrum on the street of bars. The property has a private beach area. It features free Wi-Fi and air-conditioned rooms with satellite TV. 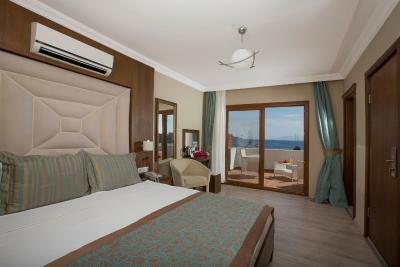 Modernly decorated rooms at Akkan Luxury Hotel include a flat-screen TV, electric kettle and a minibar. They all feature a private bathroom with a hairdryer. Some rooms offer sea views. There is also a private terrace in the suites. Daily breakfast, made with natural ingredients, is served on the terrace with panoramic sea and city views. You can taste local and international dishes at the hotel’s sit-down restaurant. The front desk is available 24/7. Airport shuttle service can be provided for a fee. There is a playground across the hotel. Only a 10-minute walk Bodrum Bus Terminal, the Akkan Luxury Hotel is just over a quarter mile to the Bodrum Castle. Milas-Bodrum Airport is 22 miles away. 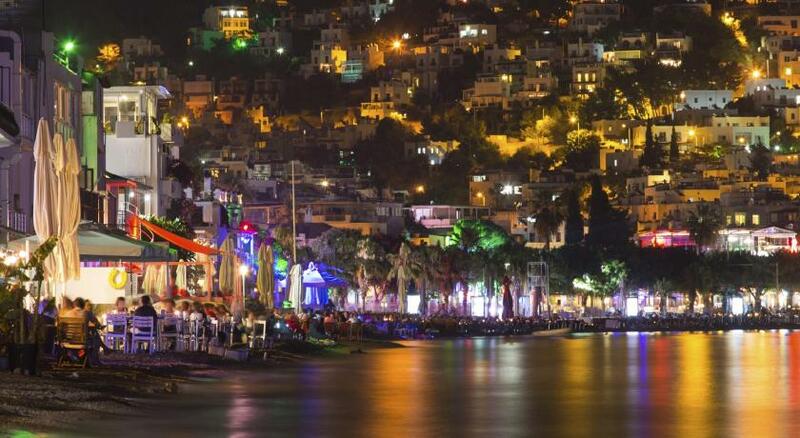 This is our guests' favorite part of Bodrum City, according to independent reviews. When would you like to stay at Akkan Luxury Hotel? This air-conditioned room includes a flat-screen TV and a mini-bar. Some rooms have no windows. This air-conditioned room includes a flat-screen TV, electric kettle and a minibar. It also offers a French balcony. This air-conditioned room includes a flat-screen TV, electric kettle and a minibar. It also offers sea views. This air-conditioned suite includes a flat-screen TV, electric kettle and a minibar. 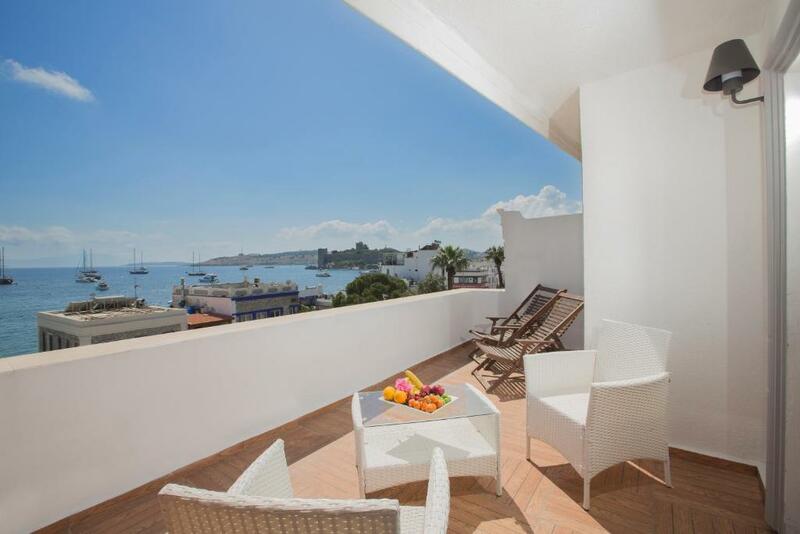 It offers views of sea and Bodrum Castle. It also has a private terrace with lounge chairs. We aimed to provide you restful and clean accomodation with our 10 years tourism experience family management.Our vision is grow that family with yours and try to serve best assistance in Bodrum Peninsula. House Rules Akkan Luxury Hotel takes special requests – add in the next step! Akkan Luxury Hotel accepts these cards and reserves the right to temporarily hold an amount prior to arrival. You must show a valid photo ID upon check-in. The room was very clean when I checked in. But what surprised me is that there was no cleaning service during all 3 nights, not even simple emptying a trash bin or change of towels. I will be honest I didn't ask for cleaning and I had an extra set of towels because I stayed in a double room alone, but this is definitely an improvement area. The WiFi signal is not very strong. There are few spots in the room that need renovation. I didn't like that I couldn't extend my vacation days because for some reason you can't use Booking in Turkey. And when I told to the owner he overcharged me for the extra nights. Also the breakfast was limited. The bathroom furnitures were falling apart and the bed was making too much noise. The hotel is located in the center BUT it has a school right by it. Meaning that you can't oversleep. At 8 you wake up because of the noise. Two things only. The location is very good. Right in the center. The cleaning lady was doing great job. It was on the beach. Conjusted suite room. Facilities was not good. Services was poor. We had such a great stay! The staff was friendly and helpful, the rooms were confortable and the location was perfect! We had 2 rooms and one of them was near to the kitchen, so is was really loud there, specially in the morning. Excellent location. Friendly staff. Great value for money. Good sea view. Breakfast was very good too. Didnt have refrigerator and to the description said that had mini bar. The top of the room need repair. The bathroom smelled like a sewer. We had to burn incense to cover the odor. The bathroom light and fan didn't work. We didn't report it because we didn't want to be disturbed. The towels had dirt stains. The headboard of the bed was dirty. The wicker coffee table on the patio was falling apart. The breakfast buffet was so disappointing that we opted to eat at a restaurant instead. We had to ask four times to get the wifi to work in our room.